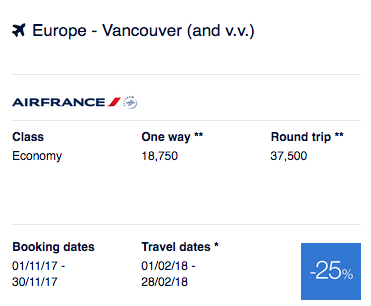 The newest set of Air France KLM's Promo Awards went live earlier this week with only one Canadian offer versus to four or so we have seen for the past few months. With promo awards the discount ranges from 25 to 50% off the regular amount of miles required to redeem for these flights. As you can see just by the discount this can be a very good offer if you get 50% off for Business Class! As has been the case for probably a year or so for us we don't get any 50% offers for Canada departures but we do get 25% off which can definitely be utilized by some! While 25% isn't as good as 50% of course, it still is something to look at if you were planning travel to Europe for February. Let's take the EUR 81.34 (~$122 Canadian) and add that to the $120 annual fee on the SPG card for a total of $242 to get a flights worth nearly 7 times that. Now that's making use of your miles! Of course this is for example purposes only as chances are by the time you apply for the card, receive and get the points after meeting the minimum spend it will be past the November end date of this offer but no matter what it affords you the option in the future since SPG Starpoints are so versatile and can not only be converted to Air France KLM Flying Blue but over 30 other airlines.